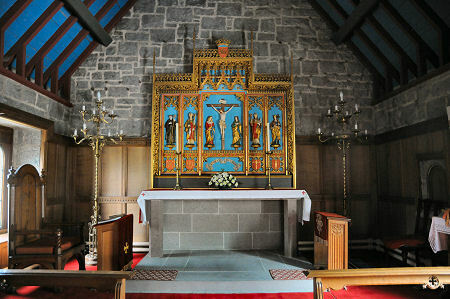 Saint Mary's, Glencoe, is a church within the the Diocese of Argyll & The Isles, one of the seven dioceses into which the Scottish Episcopal Church is divided. 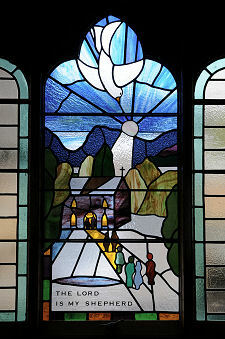 The Scottish Episcopal Church is a member of the world-wide Anglican Communion which traces its history back to St Columba and the early days of Christianity in Scotland. Like its sister-church south of the border, the Church of England, the Scottish Episcopal Church is governed by Bishops. This is one of the things that distinguishes it from the much larger Church of Scotland, a Presbyterian Church governed by representatives of the congregation. And Glencoe, or more accurately the wider Glen Coe, has been no stranger to life and death struggles, never more so than early in the morning of 13 February 1692, when 130 government troops billeted with the Glen Coe MacDonalds turned on their hosts and began to kill them. 38 MacDonalds were killed by the troops, and perhaps twice that many lost their lives in the wintry mountains while trying to escape. It is fascinating that the history of the church on display within the building suggests that the Glen Coe MacDonalds were massacred as much because they were Episcopalians as because they were Jacobite sympathisers. That's not an interpretation we've come across before. Our own take on the reasons for the tragedy are set out on our Glen Coe feature and revolve around the desire of the government in Edinburgh and London to set an example: and the Glen Coe MacDonalds being selected from among the Jacobite clans because they were very unpopular with their neighbours (and the Campbells in particular) and because they were in a location it was easy for troops to attack. Adding in a religious aspect that differs from the usual equation of Jacobites with Catholics adds an interesting spin to this dark episode in our history. It also explains why the history shown in the church goes on to relate how Episcopalians across the Highlands and Islands suffered particularly badly during the suppression of the Jacobites, which amounted to what would now be called ethnic cleansing and genocide, in the aftermath of the 1745 uprising. 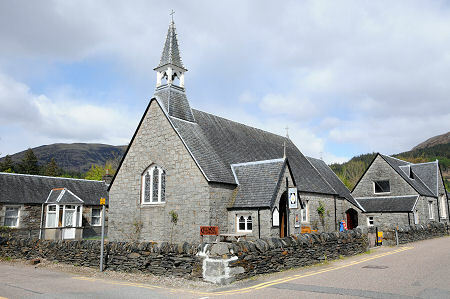 St Mary's Church stands on the north side of Glencoe's main street. The church we see today was built to a design by Alexander Ross in 1880, along with a rectory, a school and a teacher's house. Internally, the building is divided into a nave and a chancel. One of the undoubted highlights of the church is the carved wooden reredos behind the high altar, installed in about 1920. This includes brightly coloured depictions of Saints Columba, Kentigern (or Mungo), Ninian, and Margaret flanking the Crucifixion. 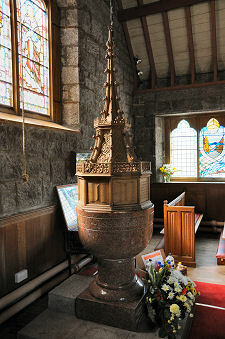 Providing some balance at the west end of the nave is the wonderfully ornate oak cover added to the font in 1935. There is also some very fine stained glass on view. 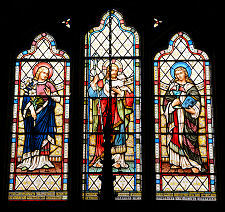 The spectacular west window was added in 1890, while some of the glass in the side walls of the nave is more recent. We were especially struck by "The Lord is My Shepherd", shown on this page.